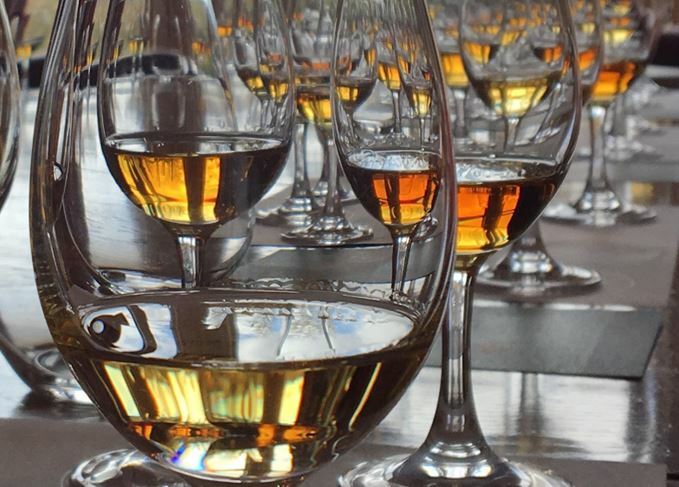 From riverside whisky tastings at sunset and dinner parties, to blind tasting battles and passionate debates, the success of this year’s Spirit of Speyside Whisky Festival was evident wherever you went. Dave Broom looks back on this year’s experience. Sand under the shoes, a river running by, gentle breeze in the waterside trees, sunshine. Shut your eyes and it’s the Tropics. Open them and there is Telford’s magnificent bridge over the Spey. There’s an apologetic cry of ‘there’s none left!’ from the crowd nearest the water, where a bottle of Craigellachie 31 is held, somewhat over-theatrically, neck-down as if to prove they weren’t lying. More people had turned up to the free beach party than had been expected but, with a combination of good weather and free whisky, who wouldn’t wander down to the secret beach? Thankfully, we found that there were plenty of other expressions still being poured. It was one of my few ventures outside the Craigellachie Hotel during the whole weekend, not because I wasn’t interested/was too busy drinking in Copper Dog, but because Quaich bar manager Lyndsey Gray and I were running six events there over the four days. In any case, I’ve also learned that if you stay at the Craig, or drink at The Highlander opposite, there’s a pretty good chance the festival will come to you. That night I hosted a dinner – poor Lyndsey had to serve – on the ‘Ages of the Spey’, which tried to demonstrate that each major period of distillery-building also ushered in a new style, which further developed the complexity of the region (which itself then linked back to the existential question we asked in our opening class: ‘Does Speyside exist?’). Around the table were people from Egypt, the Philippines, the US, Canada (‘and French Canada!’), Sweden, Belgium... and one lone Scot. It typified what the festival is about. Across Speyside people were sitting down, or standing beside, strangers. The only link between them was a love of whisky. They start to swap stories and experiences and, before you know it, everyone’s laughing or dancing and making a new, firm, friendship. It’s about – and here we turn to a popular theme on the site recently – inclusivity. There were as many new faces this year as regulars, more women as whisky drinkers, and a demographic that seems (to me at least) to be getting slightly younger. 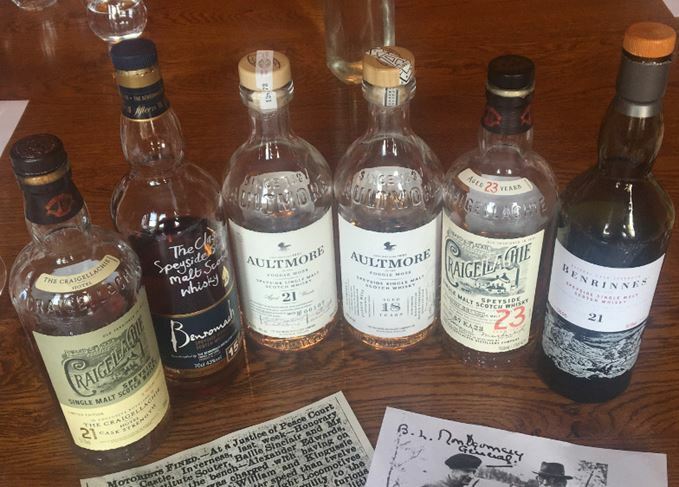 It’s a chance to get closer to understanding what Speyside is about. The enigmatic Alexander Edward suddenly burst into life thanks to Lyndsey’s mum, who did a genealogical search for us. While Lyndsey was rifling through the Elgin Library archives for more information, I was meeting 89-year-old Robert Thomson, whose daughter had read about the class and put us in touch. Thomson’s father had been Edward’s chauffeur and ghillie, and as a boy Thomson too had helped carry the distiller’s rods. The man in the archives was suddenly alive. Sometimes, though, the revelations of the real Speyside were shocking. The knockabout blind tasting between Dufftown and Rothes to see which village made the best whisky brought to light accounts of sexual congress in Glen Grant’s greenhouses, a pistol-toting barber, fire-and-brimstone preaching (courtesy of Ronnie Cox, Rothes), Sodom & Gomorrah (Dr Nick Morgan, Dufftown) and, via Sam Simmons (Dufftown), the difference between the Dufftown and Rothes alphabets: ‘The latter only goes up to B’. The Rothesians in the room took the 4-1 thumping remarkably well – perhaps still stunned by the sole member of their team to win a round being Speyburn. On the Sunday morning, I tiptoed past the snoozing boozers to the foot of Ben Rinnes for the annual tasting at Edinvillie Village Hall, where I attempted to lash together a disparate selection of drams, whose only connection is that the distilleries can be seen from the summit. It ended up being a chat about how whisky is ultimately personal to you and your experiences; the pictures in your head when you smell a dram are what links that whisky to you in a deep and personal manner by taking it away from process, and immersing it in your experiences and heart. It was a theme picked up later that night when I sat in the Quaich bar, listening and talking with Lomond Campbell as he sang songs from his new album and we chatted around Scottish melancholy, dark humour, robots, synaesthesia, and how whisky and music echo place, landscape and emotion. The room is filled with folk from any number of distilleries, locals and visitors. Drams in hand, they listen, they laugh and after the gig we all talk long into the night. How do you measure success? No doubt we’ll get press releases that give the analytics, but the real measure is surely here in the smiles and glasses, the music echoing in the mind. Over 650 events have been announced as part of the festival’s 20th anniversary celebrations. The fun and games at Spirit of Speyside are a sign whisky’s becoming more relaxed, says Dave Broom. The annual festival is about more than exclusive bottlings and distillery tours. Barbecues and village fairs to whisky launches and the unmissable Closing Ceilidh. Visit distilleries usually closed to the public, as well as rare drams at the annual festival.